Thanks mate... yeah he’s integral to the challenge so must stay. 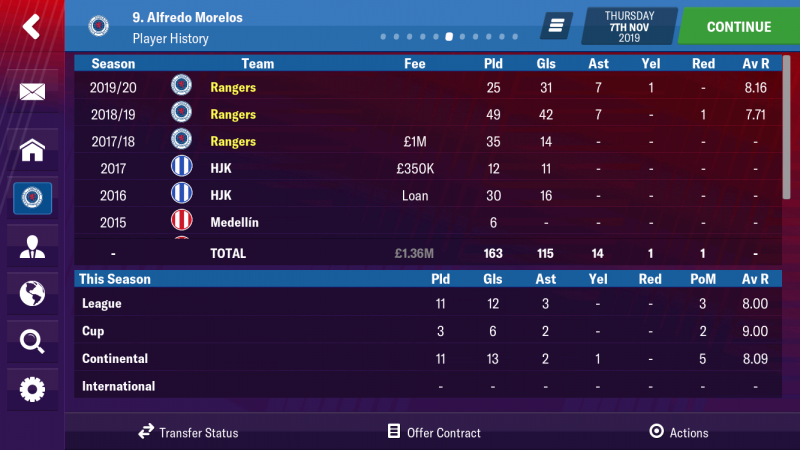 Alfredo Morelos has scored 73 goals so far under my leadership. A long way to go to 1K but I’m confident the numbers will rack up. 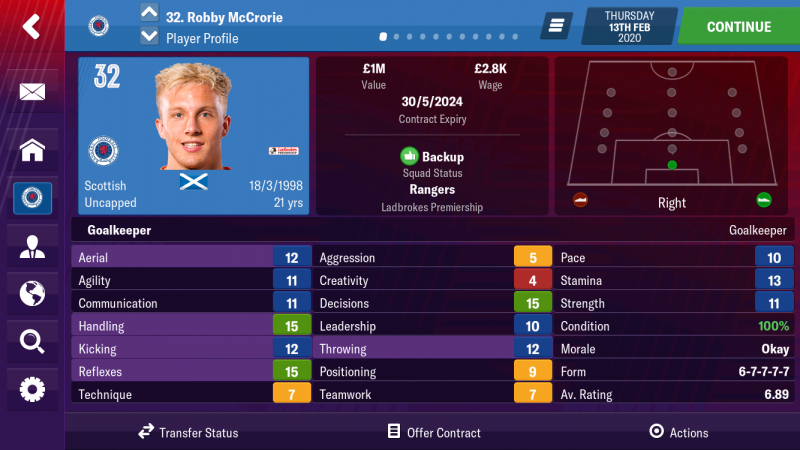 Ross McCrorie has developed exceptionally well. His passing ability makes him an ideal ball playing defender. He is a main stay at the back and future captain of the club. he has featured 56 times for me so far. We’ve won both Old Firm matches this season. 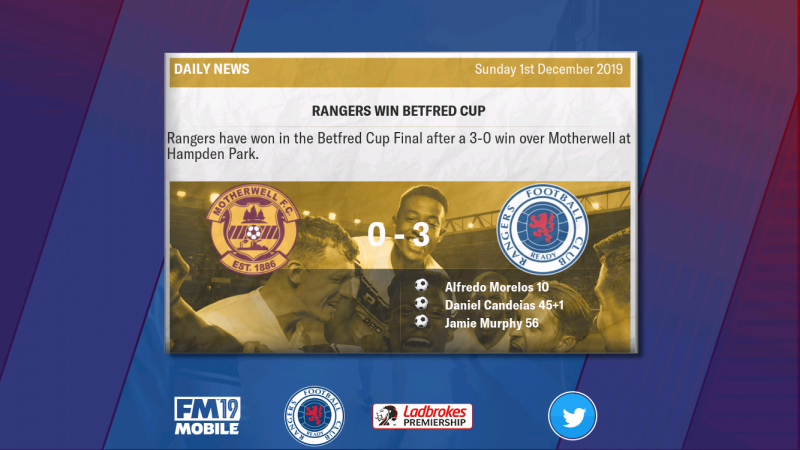 Nothing means more to the Rangers fans than a win against their rivals. Graeme Souness famously said that he would accept losing 4x against Celtic domestically, if Rangers won the league. I disagree with this and will be pushing to win all derbies... as well as winning the title. We have been miles better this season, but it’s still tight at the top. We sit 3 points clear of Celtic with a game in hand. 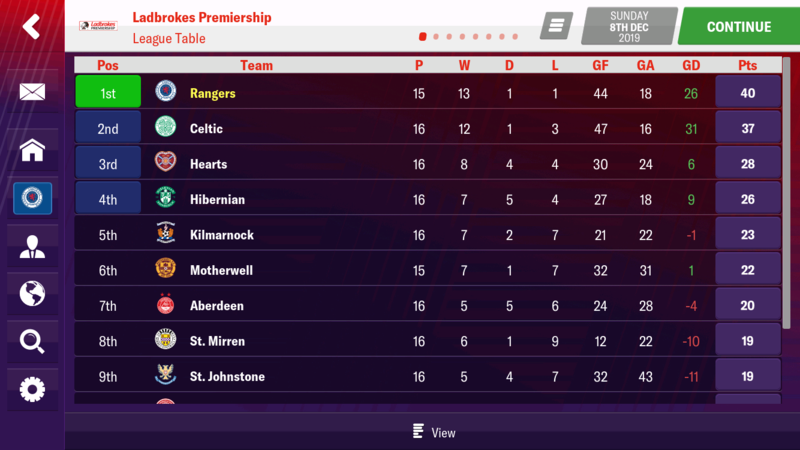 This is a great position to be in, however, with only 1 loss in 15 matches, I’d have expected to further in front. Celtic will push me all the way and it’s up to me not to drop silly points. We now play with two wingers and this is making a massive difference. The service Morelos is getting is exceptional. 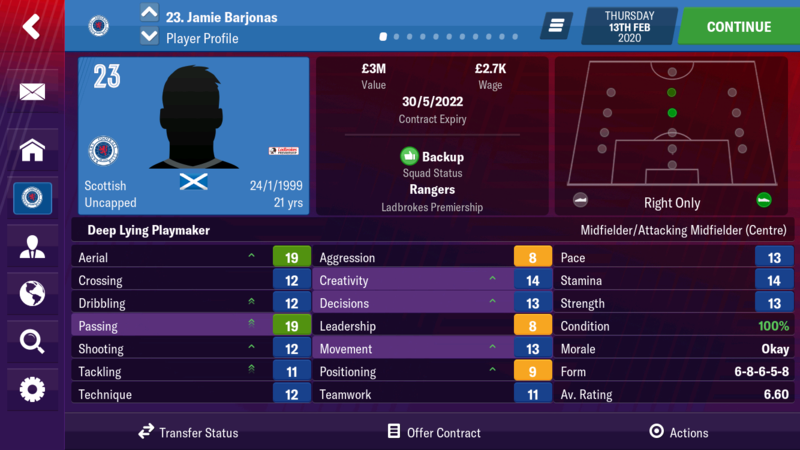 Our SS also chips in with goals/assists, a role I loved in FMM18. 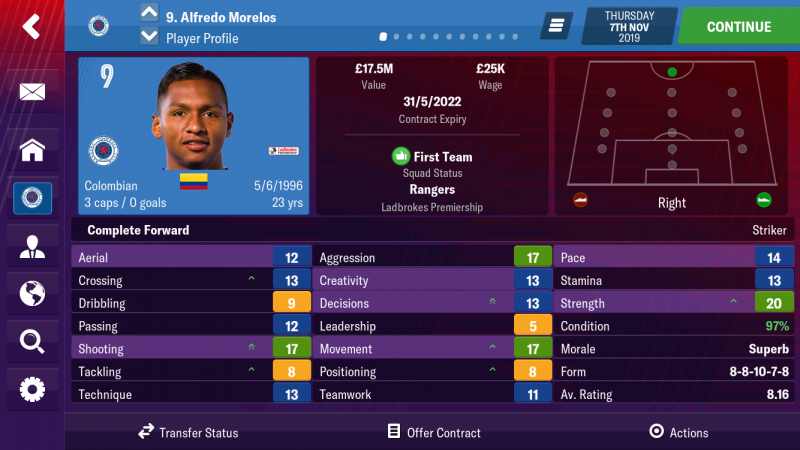 I really do rate the CF role for Morelos. 1) January Transfer Window, do we buy? 2) Europa League, do we progress? 3) Update on our young prospects, how many have made the first team? Good spotting mate 😁 more on him to follow, he’s developed well. 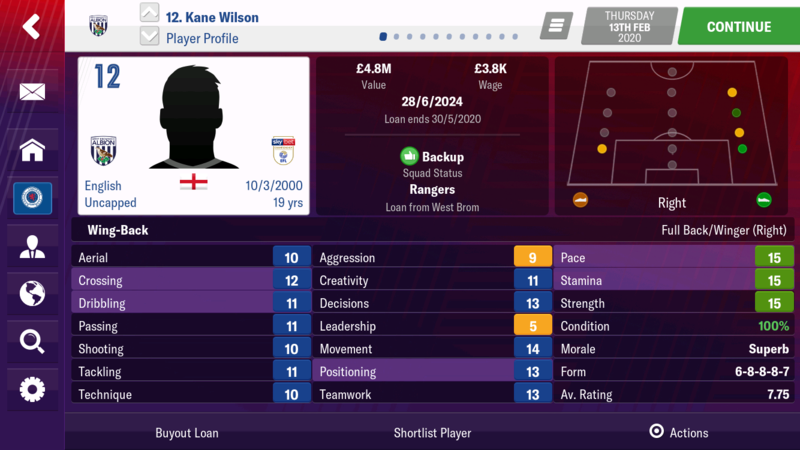 Kane Wilson joins on loan from West Brom. He’s a 19 year old right back with some pretty impressive stats. Kane is a ‘try before you buy’ we can sign him for 5.5 million at any point during his loan deal. He will rotate with Tavernier. We have brought in 8.5 million in transfer fees this season. 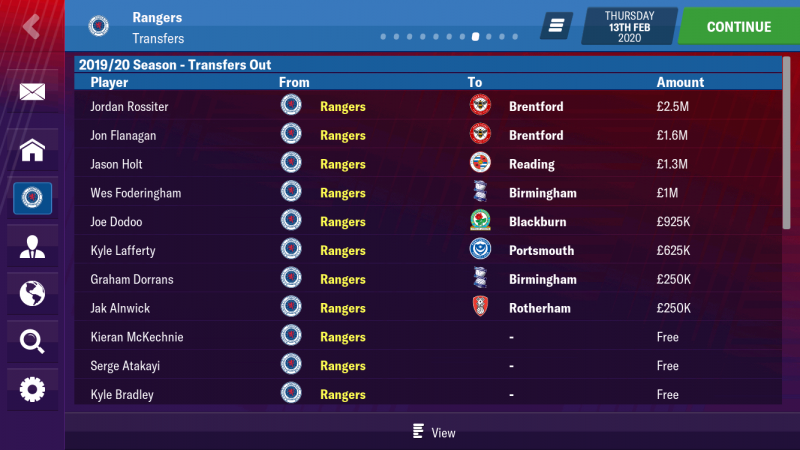 The players sold in January were Flanagan and Dorrans. None of these players were getting much game time, so to get 1.8 million combined for them, is a great deal. 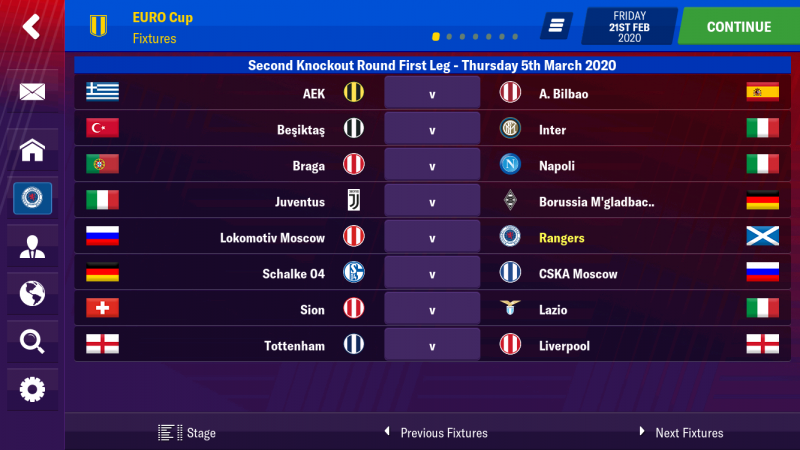 As you will see we qualify for the knockout rounds, for the second season running. We weren’t quite as strong as last season(where we went unbeaten), but we still done very well. Valencia beat us twice thanks to the signing of Anthony Martial. He ran riot against us in both matches. 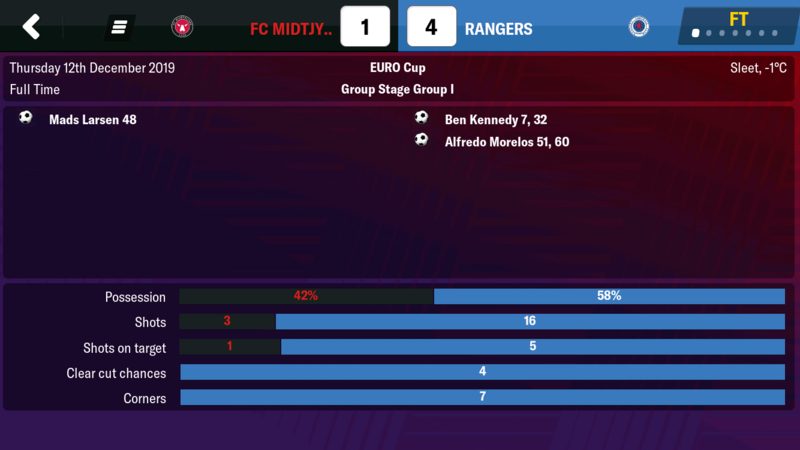 My favourite match was this 4-1 victory away to FC Midtjylland. 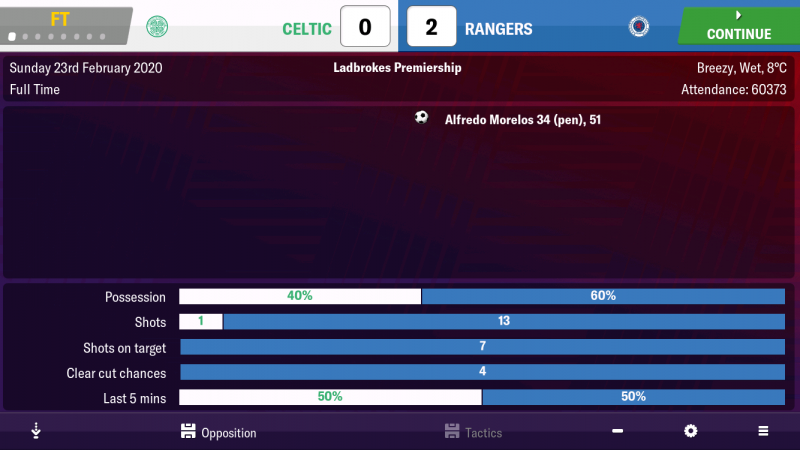 Summer signing Kennedy and Morelos, helping themselves to two goals each. We have a thing for drawing Italian giants, last season Napoli, this season... Roma! Actions speak louder than words. I told you was going to be developing the young players already at the club. It’s about time I show you some of the lads, currently in the first team setup. 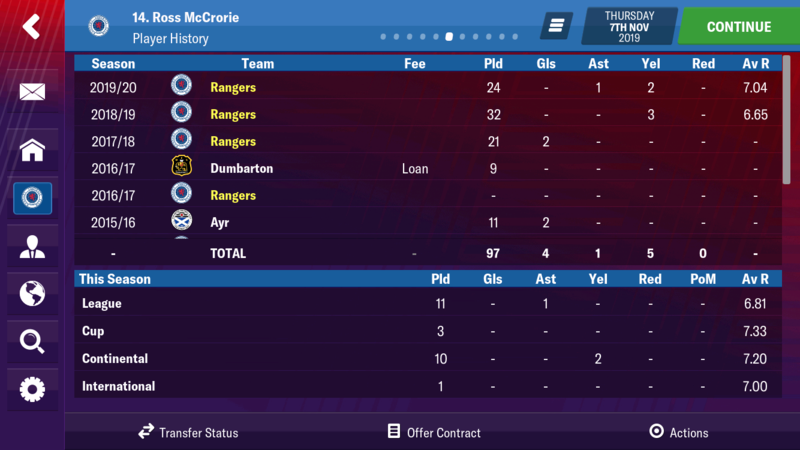 This is excluding Ross McCrorie who you have already see develop into one of the first names on the team sheet. 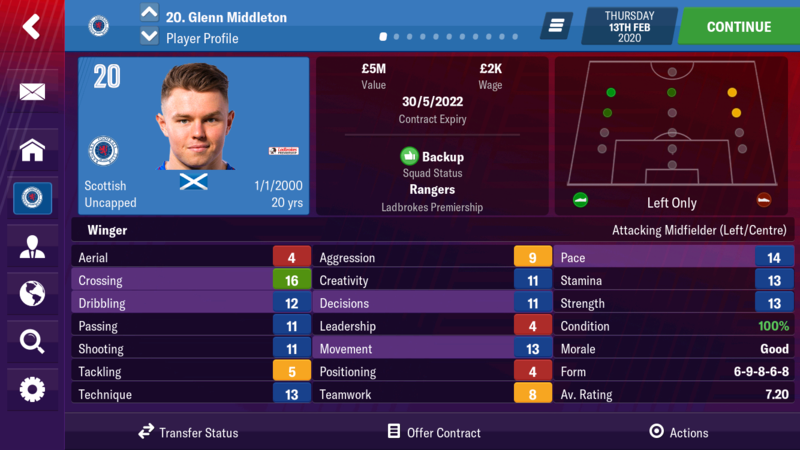 Middleton is currently a rotational player on the left wing. I swap him in and out with Jamie Murphy. He’s not quite churning out consistent performances, however, on his day he can spark us into life. Whether that be with a crucial goal or classy assist. His teamwork and leadership do worry me a little, but his crossing ability means he’s worth a shot. Docherty spent last season on loan at Shrewsbury. This done him the world of good, he has returned a much better all round player. I’ve still to decide if he’s best as a DLP or BBM, but he’s getting game time and I’ve no doubt he will be here for years to come. Burt seems to have been around for years, but is still only 21. Always being farmed out on loan, this season I gave him the chance to shine. He is perfect for the SS role, as shown by his four goal route vs Motherwell. 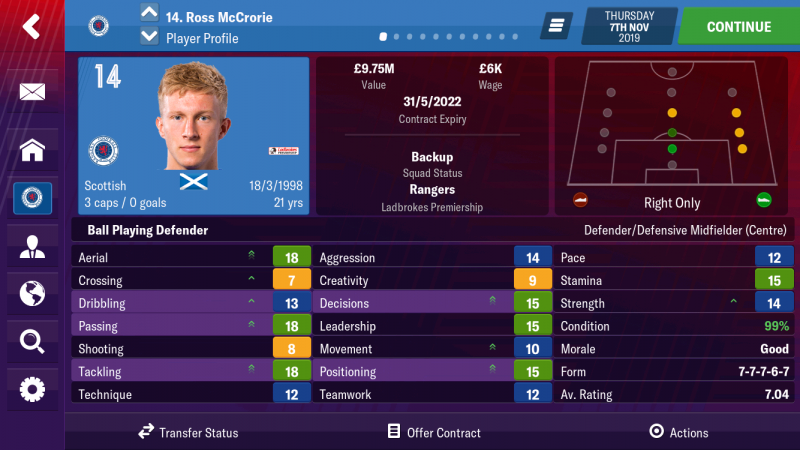 McCrorie is the brother of Ross. I like the idea of having siblings in the side. He is our number one for this season and his stats are improving game by game. Barjonas is being managed careful and game time has been limited so far. I feel next season will be his year to stake a claim for a starting spot, his 19 for passing and 14 creativity make him an ideal candidate for the DLP. Hardie has been drawn the short straw. 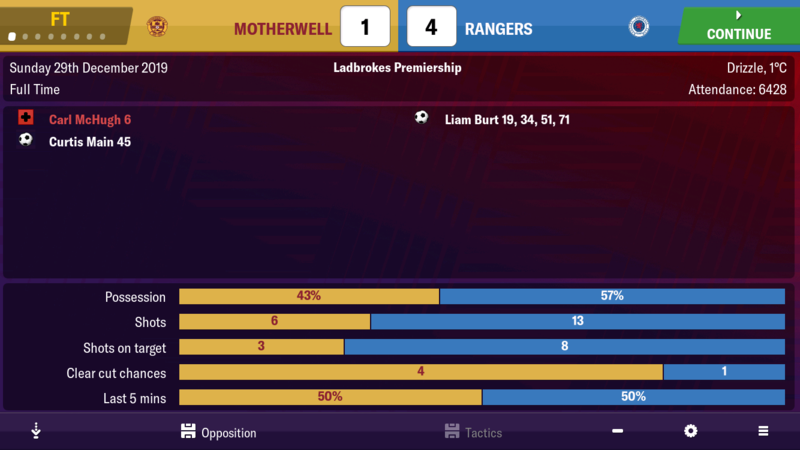 As I’m doing a 1K with Morelos, he isn’t getting much game time. He is my backup striker but has had to make do with substitute appearances. 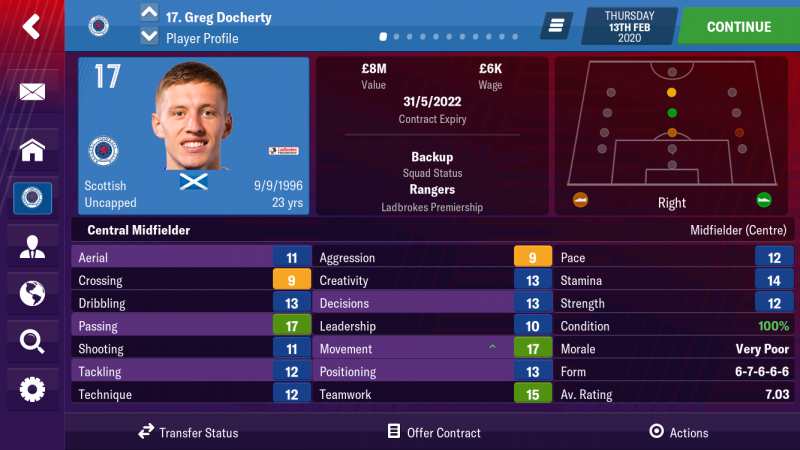 Hopefully he can still develop, if not I may sell him for his own good and resort to having a more experienced backup. 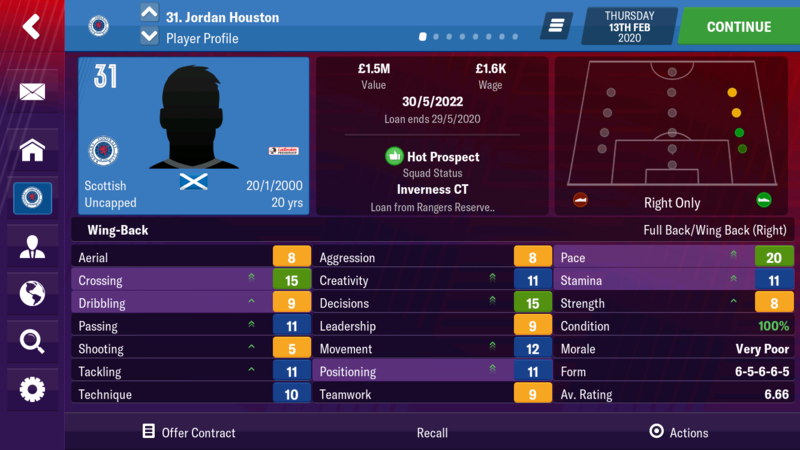 Houston is currently on loan at Inverness. He is someone I see a future for, could possibly retrain as a winger with that 20 pace and 15 crossing. 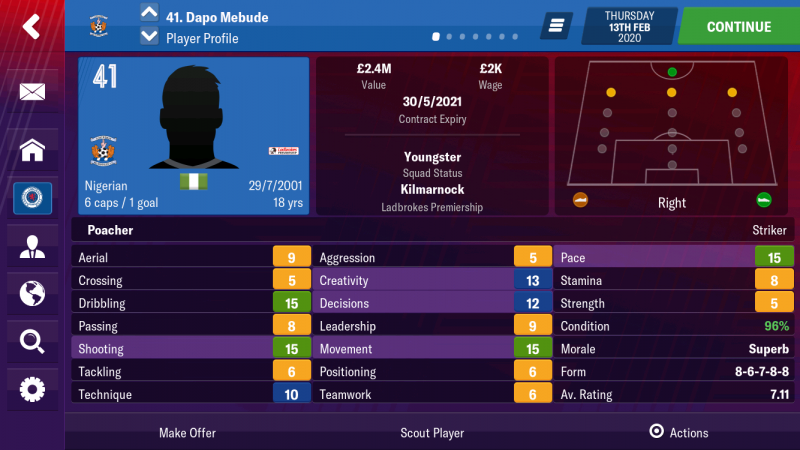 Dapo was sold to Kilmarnock in a straight swap for Greg Taylor. I didn’t see a future for him but his stats are actually improving. Cheers mate. 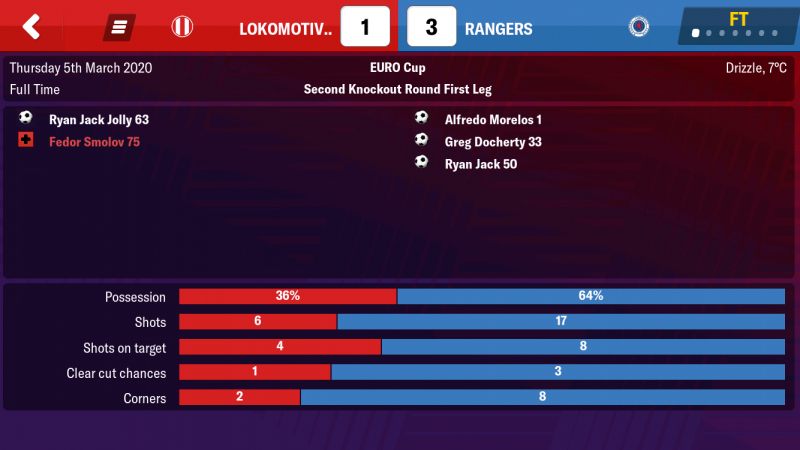 Dapo wouldn’t have got much of a game as I play with a lone striker. Good read and good luck! 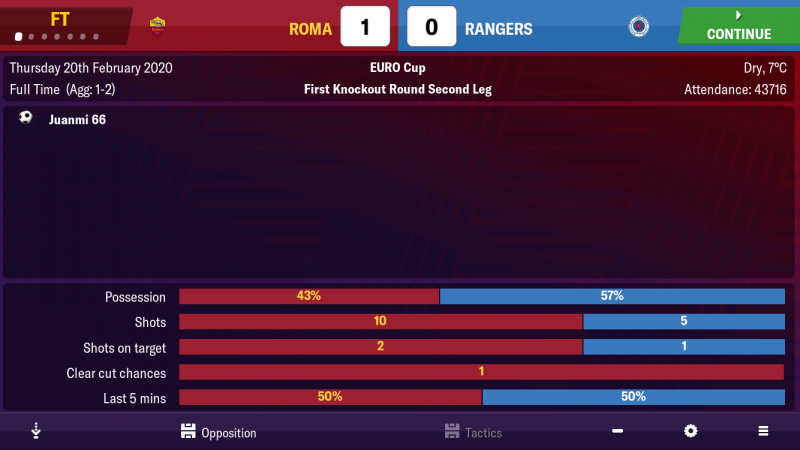 I did a 1k with Chuba Akpom and Rangers in FMM18 and really enjoyed it. Do you not find playing a shadow striker takes some goals away from Morelos? How did you get on mate, were you successful? He’s actually been scoring more goals since I’ve played a SS. I previously had an AP but the team were struggling for goals. 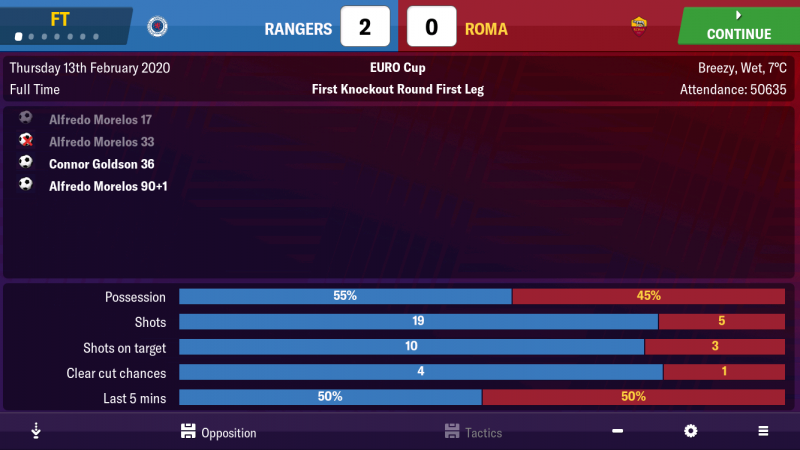 We shocked the world of football with a 2-0 win at home to Roma. We managed to hold on away from home to send us through! We draw Lokomotiv Moscow, which is a favourable tie for us. With 10 games left, can we end Celtic’s quest for 10 titles in a row? I hope so. We have been excellent this season and currently hold a 4 point lead. 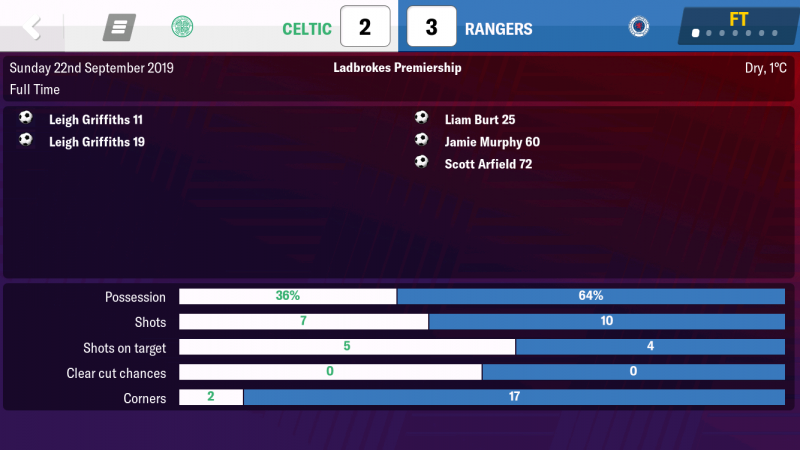 We also just beat Celtic 2-0 away from home. This was our most dominant display against them, during my time at the club, reducing them to just one shot on goal. 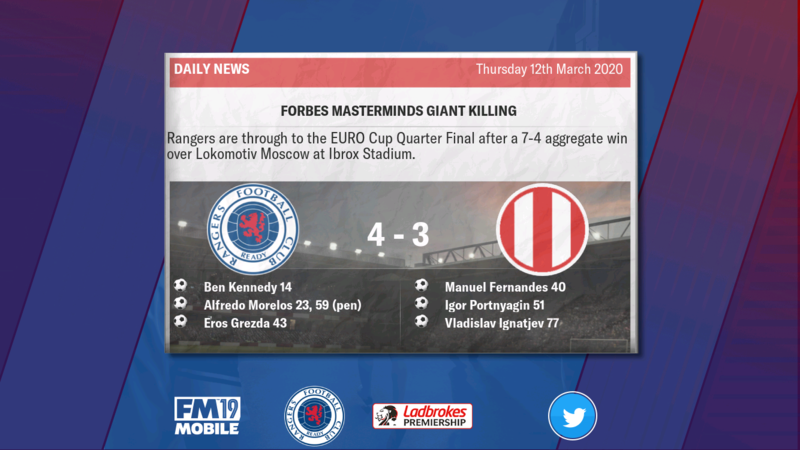 Great Result against Roma, Lokomotiv Moscow is a easier tie but by no means a weaker side, Euro and League double would do nicely haha! Did a Celtic one too but don't suppose you'd be too keen on that one! I always found an AP or Treq worked best behind the striker but if its working for you then great! Going well so far, i'll keep following. Doing a 1K and focusing on youth has added an extra element to the challenge. I’m loving it. To complete this in 13 seasons with Akpom is an unreal achievement. We done it! 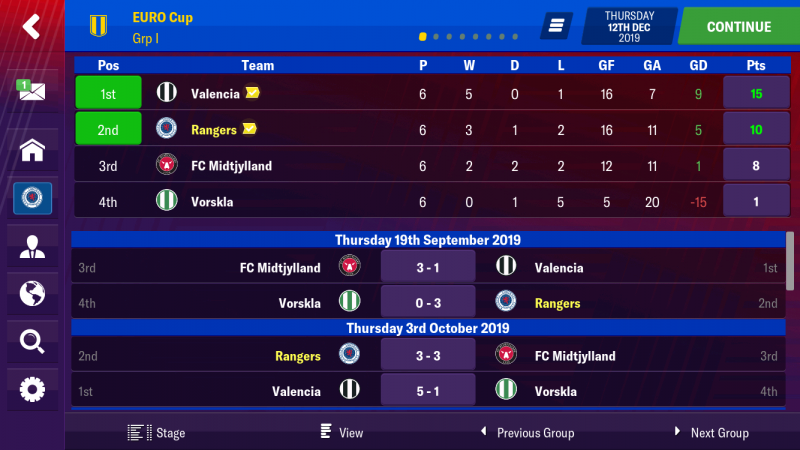 We have won the league by 8 points. 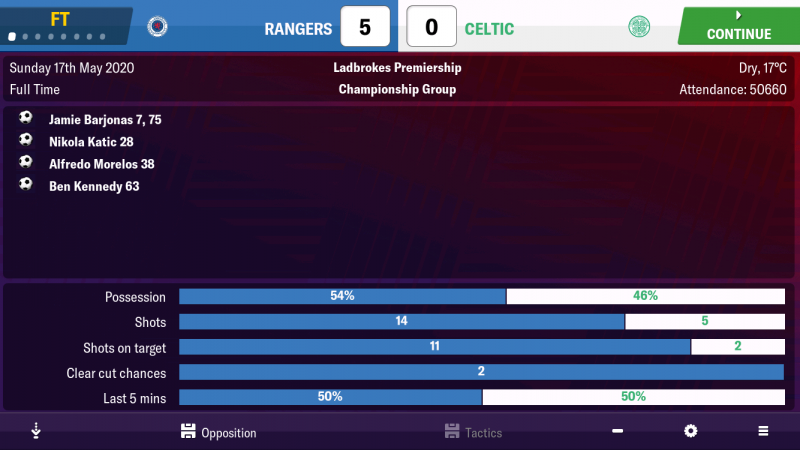 We scored 109 goals in the process, include 5 in this thrashing of Celtic, on the last game of the season. El Bufalo finished the season on a massive 65 goals in 61 appearances. This takes him to 107/1000.. a long way to go but big improvement this season. I expected us to beat Lokomotiv and we duly delivered. 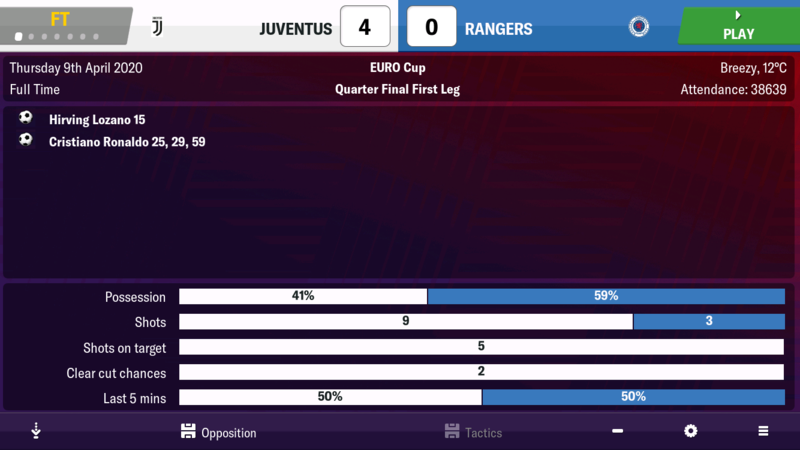 Comfortably winning 7-4 on aggregate. 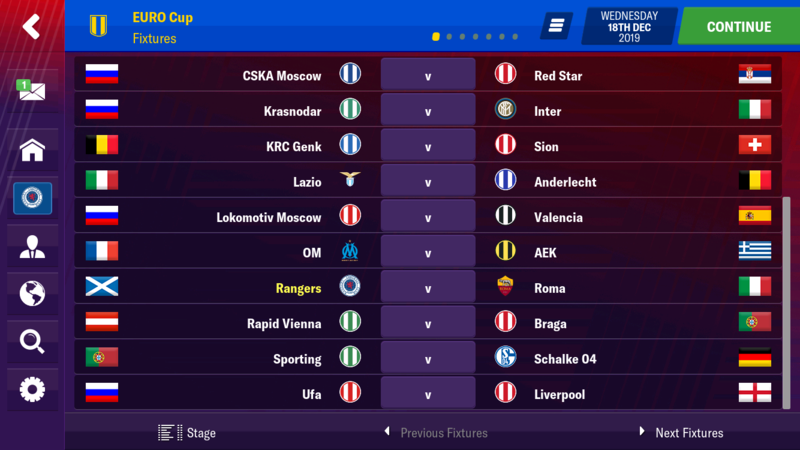 We would then be drawn against Juve... a mouth-watering tie for Rangers fans. 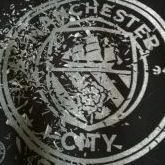 After a 4 nil hammering away from home, I just wanted to keep things respectable at home. After all, we are up against a team inspired by Ronaldo. We won!!! A historic victory. We may go out of the competition, but the Quarter Finals is a great achievement for us. Next season sees us fight to keep hold off some of our top talents. Who will go? Who will stay? Who will take their place? Thanks man, now it’s about consistently winning the league. 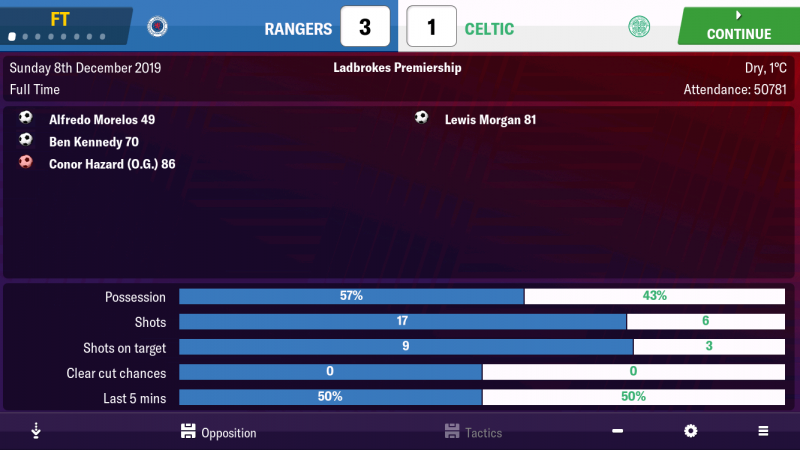 Brilliant result against Celtic! 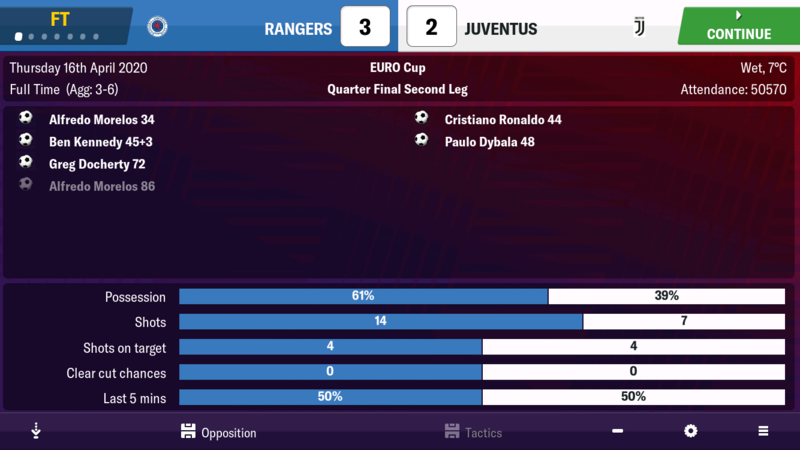 Nice win over Juventus as well 😃 Can't wait to see how you get on next season!